Your local park needs your love! 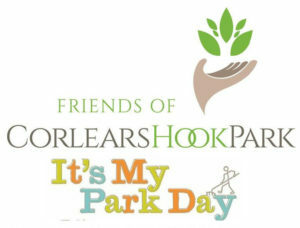 Join your neighbors for “It’s My Park” Day at Corlears Hook Park on Sunday, October 22, 10:00 am – 1:00 pm. 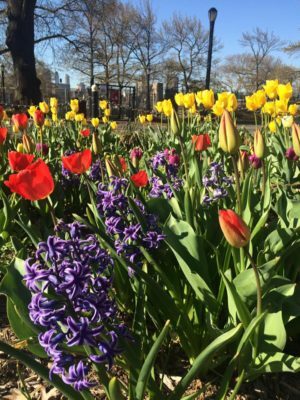 You can help plant daffodil bulbs, rake autumn leaves, prune and weed the gardens, and spruce up the park all around. Tools and supplies provided … snacks and water too! 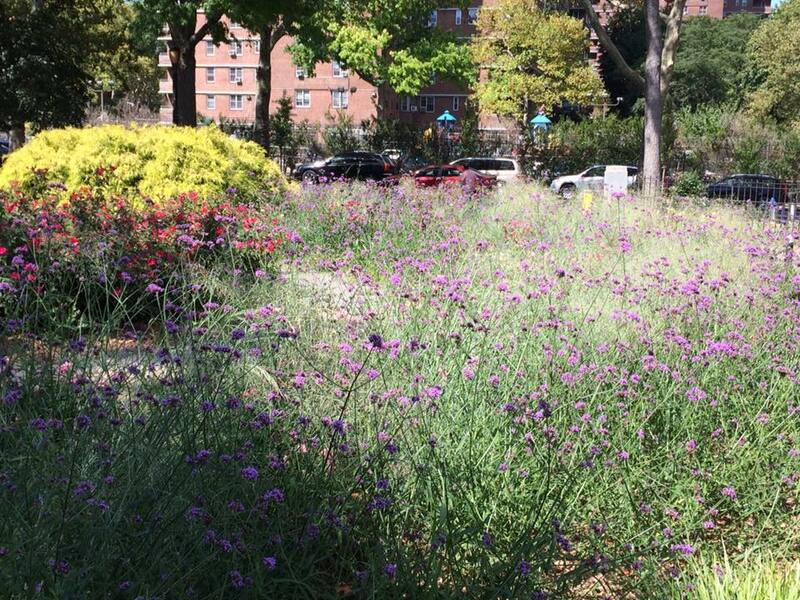 Corlears Hook Park is our main entrance to the East River, and a jewel right in our backyard. Please join us! 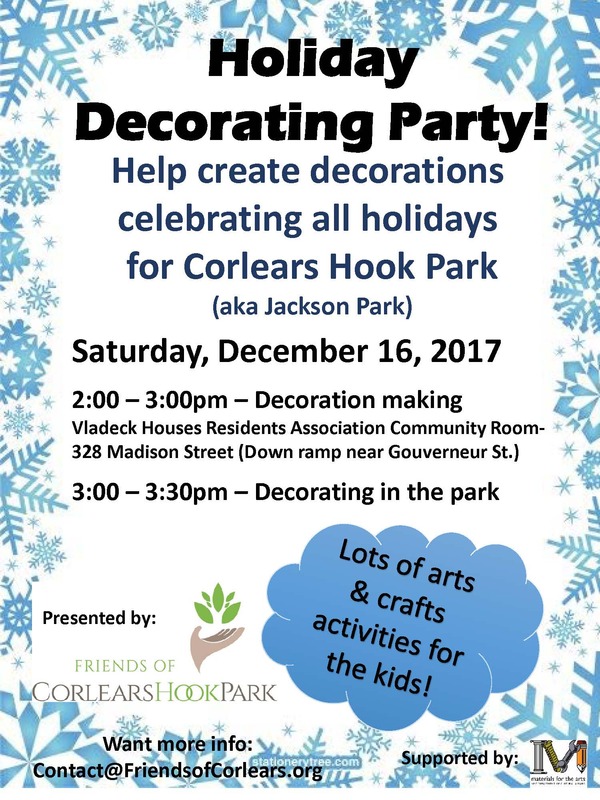 “It’s My Park Day” was rained out last month, but you get another chance to help out at the amazing Corlears Hook Park this Sunday, November 6, from 11:00 am to 3:00 pm. Volunteers will be planting daffodil bulbs, raking leaves, weeding the gardens, and giving the park a good, solid once-over. Please come out to help! Michael Marino of Friends of Corlears Hook announced this weekend that the NYC Department of Transportation will be installing a proper crosswalk on Cherry Street so pedestrians — and, more specifically, people in wheelchairs — can reach Corlears Hook Park safely. A stop sign will also be installed at the crosswalk. Currently there is no way for people with disabilities to cross Cherry Street to get to and from the park, as there is no cut-through on our side of the street facing the Corlears Hook Park entrance. In addition, residents have complained that the crossing is particularly unsafe for children who may not be taller than the cars parked on the street. 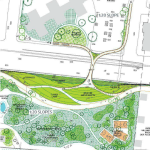 In addition, two “enhanced crossings” will be installed across Jackson Street near the intersection with Cherry. These will not be controlled by a stop sign, but will have signage alerting drivers to pedestrians, and will include cut-throughs for wheelchair access. 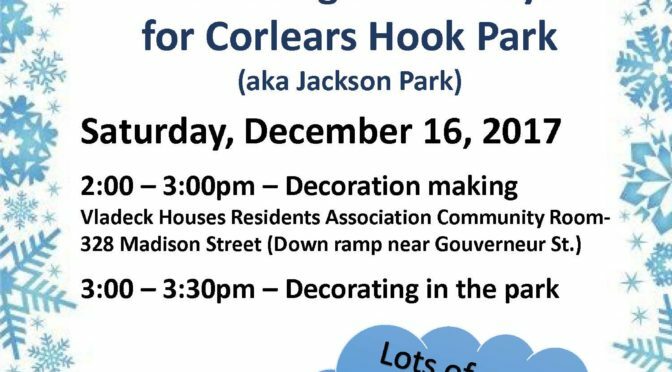 Michael Marino, a member of the house committee and the founder of Friends of Corlears Hook, has been instrumental in pushing the DOT for safer access to Corlears Hook Park and, through it, access to the East River. Especially with an East River ferry stop still planned nearby, foot traffic to and from the park is likely to continue to increase. 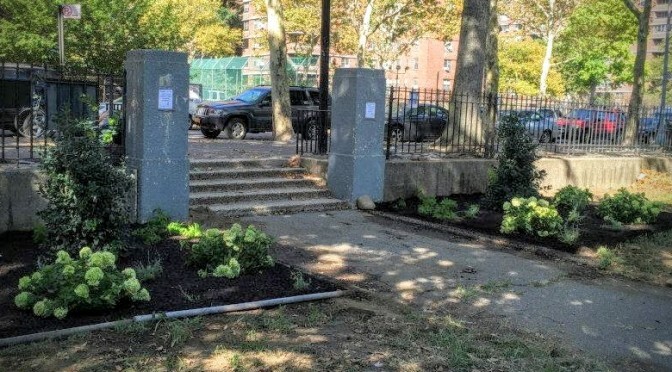 Corlears Hook Park needs love in the fall — help plant daffodils bulbs, rake leaves, prune & weed the gardens, and generally spruce the whole place up! Friends of Corlears Hook and the Parks Department will provide tools & supplies, as well as water & snacks. Questions? Email Friends of Corlears Hook. Project planners for the East Side Coastal Resiliency Project have retreated from last year’s ambitious preliminary designs for a new pedestrian bridge across the FDR at Delancey Street in the face of engineering obstacles and controversy in the community. Curved ramps and an organic span over the FDR have become straight lines due to municipal requirements that the new structure be easily maintained with standard building elements. 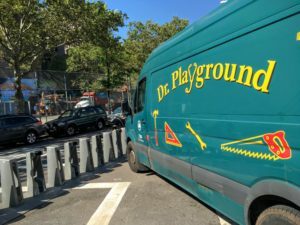 A wide, welcoming park entrance on Delancey has been narrowed because of Department of Homeland Security requirements that a 50-foot security buffer be respected next to the Williamsburgh Bridge foundation. An approach toward Grand Street for improved access to bus lines has been scrapped after considering the narrow sidewalk in front of building 4 and opposition from building 4 residents. 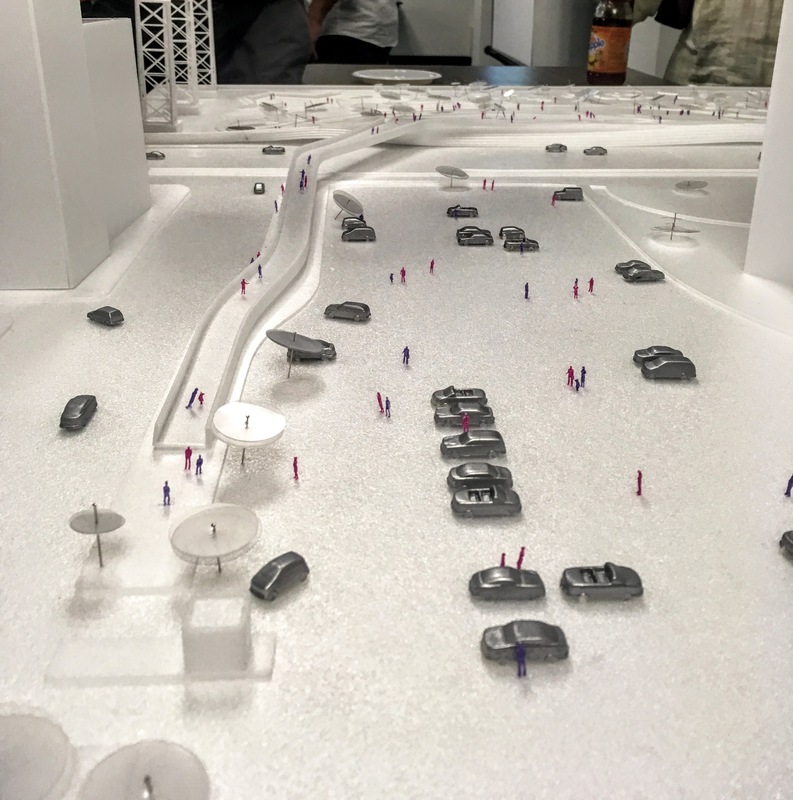 This last element — an approach toward Grand Street — was the most controversial when preliminary designs were shown last fall. Presenters tonight in the East River community room carefully explained the engineering and other obstacles that have forced them to abandon that part of the concept. A full ramp leading to Grand Street, where three city bus lines congregate, had no room over the narrow sidewalk and frontage road for supports. A shorter staircase faced similar problems and would have violated a stated goal of universal access, the idea that stairs should not be built where a ramp could not. What’s left is still an improvement over the current bridge. View of proposed bridge from Delancey street looking toward the FDR and East River. A shallow 5% grade on the ramp makes the park much more accessible for the elderly and disabled. The ramp would be 4- to 6-feet wider, making it safer for pedestrians and bicycles to coexist. New placement of the entrance ramp and relocation of the East River parking lot entrance enlarges the buffer between cars and bikes. There’s still a lot left to learn about what the full ESCRP designs will look like. We are just over one-third of the way through the design process, with several more milestones for public engagement before plans are finalized. The date for construction to begin, which had been fast-tracked to 2017 by aggressive federal funding deadlines, has been pushed back two years. 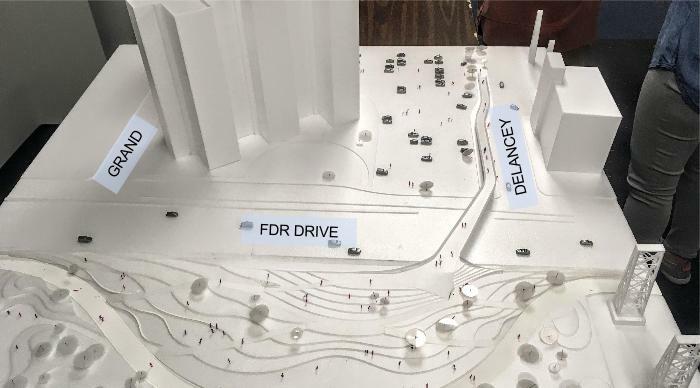 In particular, the question of what materials will be used — and whether sound absorbing materials can be used for the 8-foot wall we will be looking at across the FDR — could not be answered at all, and apparently will not even be considered until farther into the process. It’s been a year since we’ve received any update on the huge East Side Coastal Resiliency Project, the federally-funded reconstruction of our East River waterfront to prevent another storm surge like the one we experienced during Sandy in 2012. 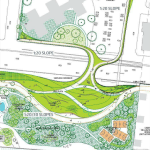 But now we have a big chance to hear what the engineers and landscape designers have come up with in that time during a public meeting this Thursday at 7 pm in our community room (building 4, section M). 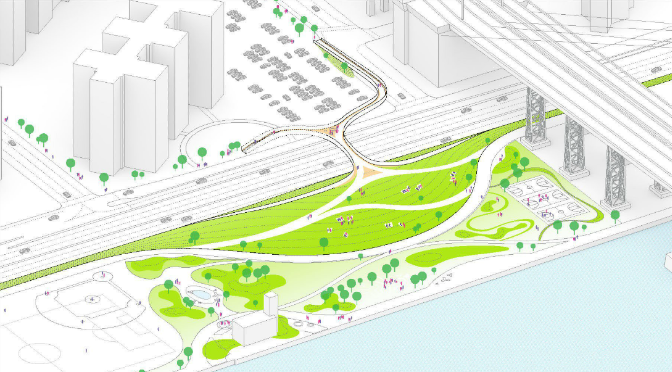 Of particular interest to cooperators will be what project planners are proposing for the pedestrian bridge over the FDR Drive next to the Williamsburg Bridge. Last year, three directions were shared: one which stayed mainly true to the existing bridge; a more elaborate design that included a winding bridge and a stairs leading right in front of building 4; and a reimagining of the bridge as a full extension of East River Park into building 4’s lap. Participants in public sessions last fall were largely weary of option 3, which seemed to take too much away from our own property. A heated discussion broke out among cooperators about the benefits and drawbacks of the staircase in option 2 — some thought it would encourage use of the park by providing a quicker pass from Grand Street, while others thought it would bring death and destruction. Project planners seemed inclined to avoid any controversy, especially as a simpler bridge design would allow them to spend limited money on the other pedestrian bridges at Houston, 6th Street, and 10th Street, so it would not be surprising if their proposal this year looks more like last year’s more limited Option 1. But nothing is final, and community feedback is still important to this process. The Henry M. Jackson Playground, on the corner of Henry and Jackson Streets across from Fine Fare, has been fenced off and reconstruction has begun on schedule. 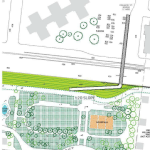 The $1.7 million facelift as part of the Mayor’s Community Parks Initiative started planning in 2015 with community input, plans were finalized earlier this year, and construction is expected to take 1 year. 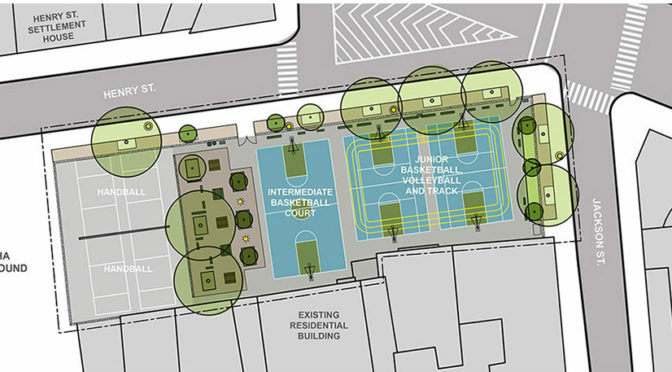 Existing facilities — basketball, handball, and seating — will be retained in approximately the same arrangement. Note that the playground easy of this park belongs to NYCHA and is not part of the reconstruction. Two fun events are happening this Sunday in our immediate neighborhood. 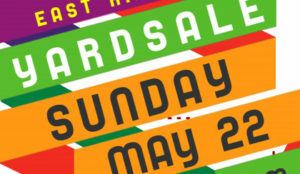 First up is the East River Coop Yard Sale from 10:00 – 2:00 on the blacktop next to building 2 (577 Grand Street). About 40 cooperators will be selling items like books, household items, kids’ clothes and toys. Come ready to haggle and to find a bargain! 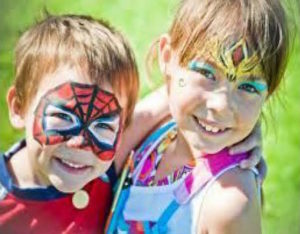 Then from 1:30 – 3:30 is Family Fun Day at Corlears Hook Park. CityParks PuppetMobile is presenting “Puss in Boots”. Grand Street Settlement’s Clubhouse will be showing off interactive games created participants in their weekly program. The Tenement Museum will have some fun and instructive art projects for the kids. The NYPD and FDNY will have a precinct car and firetruck on site for kids to explore. You can find out information about summer programs at Henry Street Settlement, Education Alliance, and GOLES. 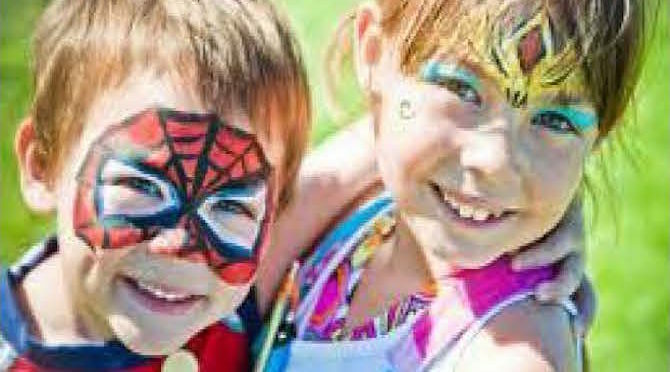 Families are encouraged to bring a picnic and enjoy the park! Spring flowers at Corlears Hook Park. Photo by Andrea DiFiore. 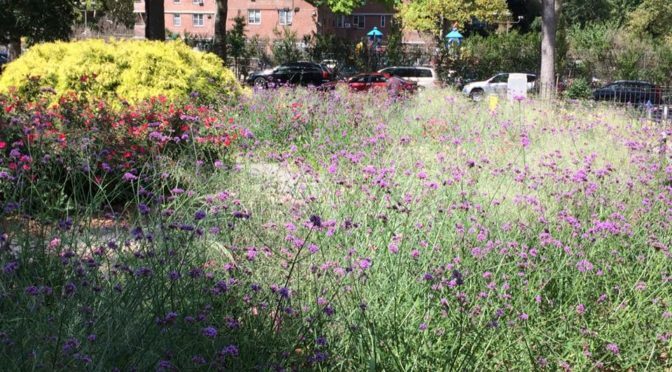 Join Friends of Corlears Hook Park on Sunday for their annual It’s My Park Spring Clean-up! Volunteers are needed to help beautify the park by weeding, raking leaves, painting benches and planters, spreading fresh wood chip in the dog runs, and planting. They’ll provide all the tools necessary to get the work done, as well and some snacks and water — all you need to bring is your smiling face and helpful hands (even if you only have 20 minutes to help out). Please wear comfortable clothes that you wouldn’t mind getting dirty. While you’re there, take a look at the huge improvements made over the past couple days as part of the Mayor’s Community Parks Initiative (CPI).